Jaw Couplings Also known as Lovejoy couplings, these have a spider-shaped cushion between two hubs to reduce shock and handle minor shaft misalignment. To create a complete coupling, order two coupling hubs and one spider. 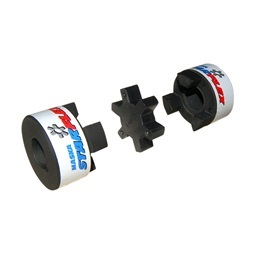 Buna-N spiders provide good vibration damping and chemical resistance.Temperature range is -40° to 212° F.